So, here’s a delicious sandwich…a rather massive, delicious sandwich — fit for a king. Oh, by the way his logo is a “crown” and he refers to himself as a king, so dammit…this is The Big KRIT “KING” Burger. Big K.R.I.T. is dropping his first official album early next year, but in the meantime, wait for another free album dropping very soon called #4evaNaDay. The two albums that made me fall in love were Krit Wuz Here and Return of 4eva (also affectionately known as R4). Go download both from iTunes, your ears will thank you. 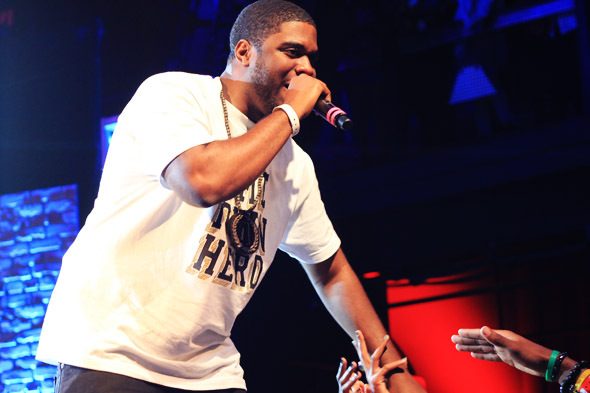 Here’s my favorite KRIT video…this one speaks volumes about just what kind of man he really is. How could you not love him?? I didn’t take a bunch of pics this time around because I’ve used the same preparation techniques that I’ve posted in earlier recipes. done. 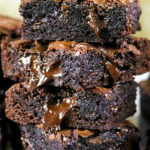 keep this in a container in your fridge for up to 5 days. I bet you can’t finish it all. I shared it with a friend and we both left a good 1/3 of it left. It’s truly massive but incredibly delicious. Make a slider version if you’d like! 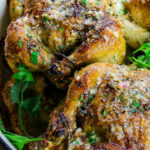 Preheat the broiler on your oven. 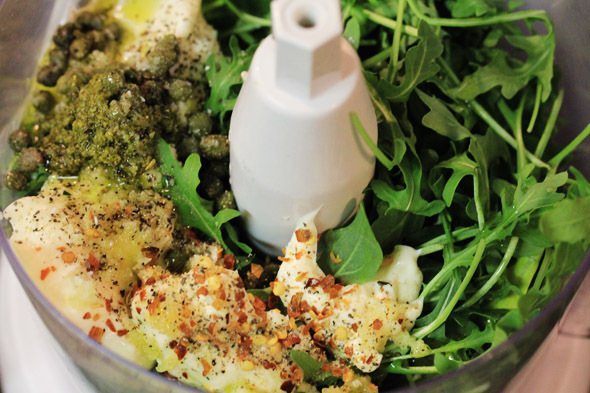 Place all of the ingredients for the arugula-pesto mayo with capers into a food processor, and blend until creamy. 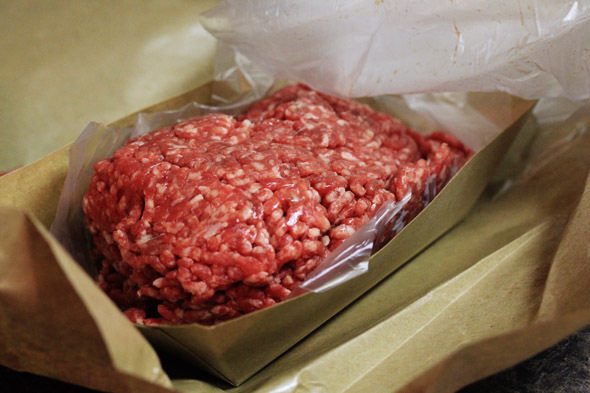 Transfer to a small container and place in the fridge while you prepare the rest of your meal. When ready to eat, slather it on both sides of your toasted bun before building your burger. 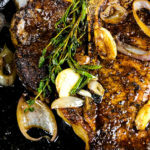 Season the beef with the heavy cream, olive oil, worcestershire, and other seasonings. 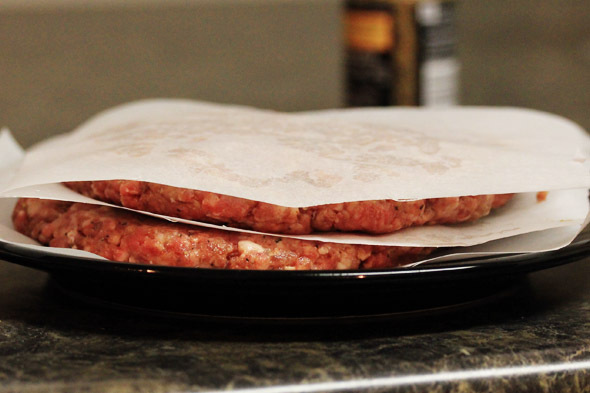 Divide the ground NY strip into 4 large thin patties, about a quarter of an inch thick and set to the side. Place a heavy bottom skillet (cast iron is great) over medium-high heat. Drizzle about a tbsp of olive oil into the pan and when the oil starts shimmering, you’ll know its hot enough. Cook 2 patties at a time, about 4 to 5 minutes per side. Repeat until all patties are cooked. Line a small baking sheet with parchment paper or foil. 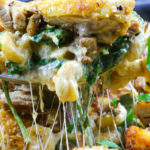 Place 2 slices of cheese on top of each patty and set under the broiler on the lowest rack of your oven until the cheese is melted and bubbly. Don’t take your eyes off this, it melts pretty quickly. Stack 2 patties on top of each other, making 2 large double cheeseburgers and pile with the rest of the fixin’s. Heat about 3 inches of oil (I used vegetable) in a large pot (I used a cast-iron dutch oven) to 375 degrees. Rinse the shrimp and pat dry with a paper towel. Combine the egg, heavy cream (or milk), salt, pepper, old bay, cayenne pepper and paprika in a small dish. In a separate dish or ziploc bag, combine both the panko and italian bread crumbs. Place the flour in another separate dish or ziploc bag. You should now have a breading station set up in this order: flour, egg mixture, bread crumbs. Coat each shrimp with the flour and shake off the excess. Dunk it into the egg mixture ensuring it’s fully coated, let the excess drip off, then toss the shrimp into the bread crumbs. Make sure you press the crumbs into the shrimp so that they stick. Fry the shrimp until golden brown, about 4 to 5 minutes. 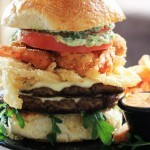 Drain on a paper towel, then place 4 shrimp on top of each Big KRIT “King” Burger. 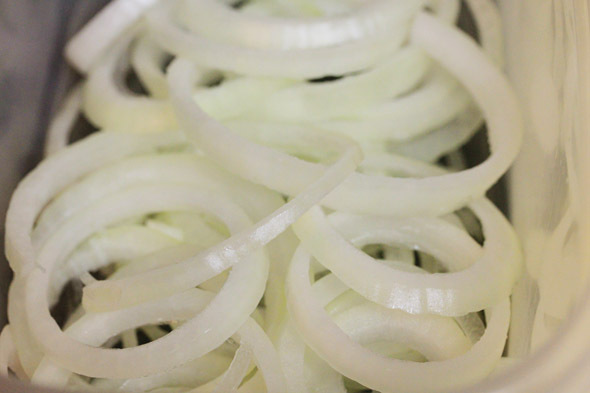 Soak the raw onion rings in buttermilk or milk, for at least one hour in the refrigerator. 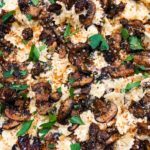 Mix together the flour, seasoned salt, dried parsley, cayenne pepper, and paprika into a medium bowl or large ziploc bag. 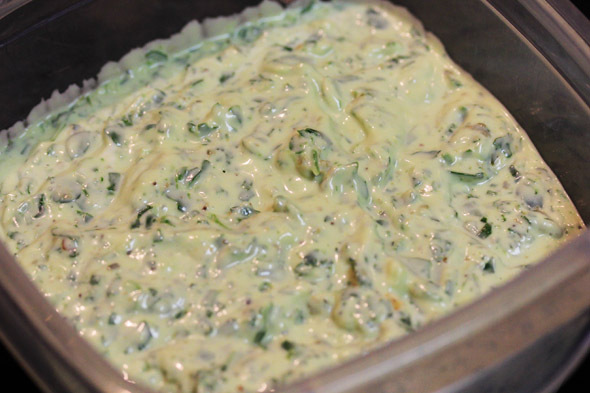 After an hour, remove the onion rings from the buttermilk and immediately coat them with the flour mixture. You can do this in batches. Make sure they’re fully coated with flour, then fry them all in 375 degree oil (you can use the same oil you used for the shrimp) for about 5 to 8 minutes, or until lightly golden brown. Drain on a paper towel and season them with a little salt immediately out of the fryer. Place on top of your Big KRIT “King” Burger. Slather the mayo mixture on your buns, then pile some arugula or other leafy green lettuce of choice on top, then your double patties. 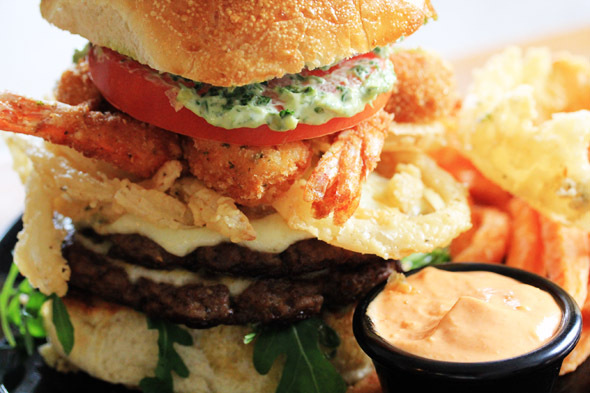 Next top with the onion rings, then the shrimp, the tomatoes and top it off. 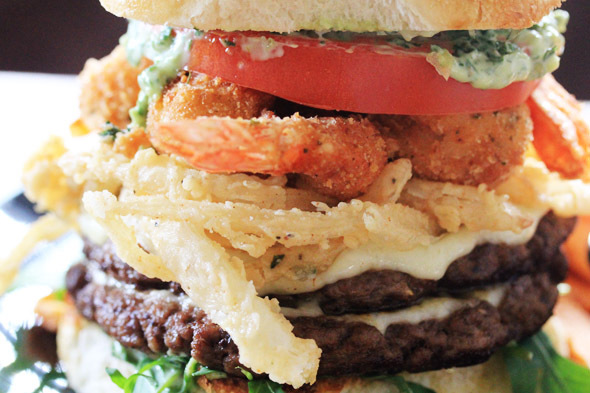 You’ll have two monster Big KRIT burgers that will feed two extremely hungry people. Great for sharing. 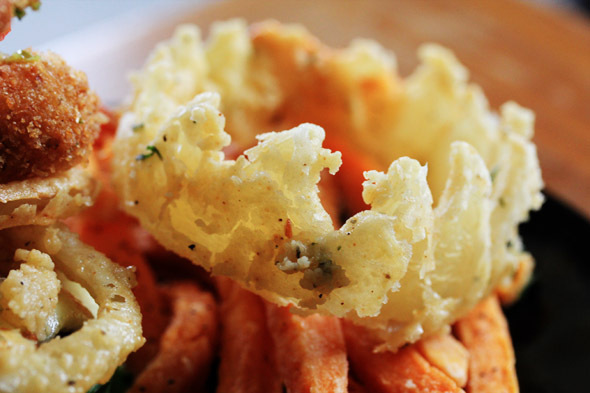 Serve alongside sweet potato fries with sriracha-mayo for dipping. Delicious. Time everything as best you can so that everything is done at the same time. You can make the arugula-pesto mayo way ahead of time. The onion rings can soak hours in advance as well. Fry your onion rings and shrimp in the same pot (but not at the same time). If I were you I’d fry the onion rings first, then the shrimp. Leave the tails off the shrimp so that you don’t eat them, I only left them on so you can tell what they were. If you want, you could turn this recipe into 4 single patty burgers instead of 2 massive double-cheeseburgers. Just place two pieces of fried jumbo shrimp on each sandwich instead of four. 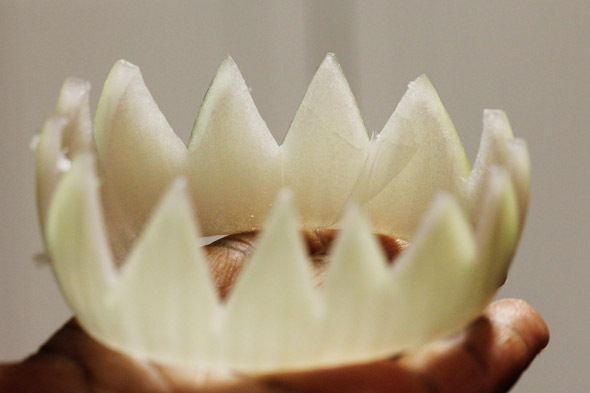 Again, you could make a slider version of this so it’s easier to eat, haha! 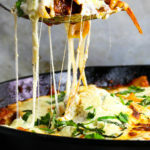 OMG, this looks incredible. He will surely loves this. I want this for myself. 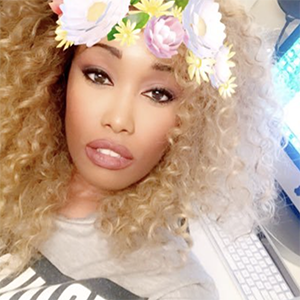 You are too talented lady. I have got to get me one of these. Congrats to you. OMG what is wrong with you!? 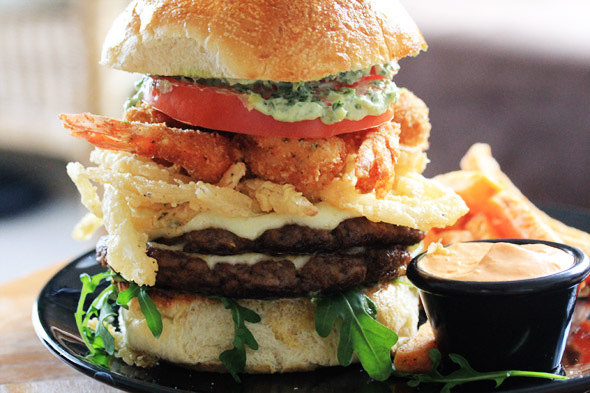 This burger looks bomb as hell!…I don’t know what to say…………If anything was ever true you need to open a burger spot in DC! I know folks would line up for these!! Now that’s some Country Shi*! Looks amazing. 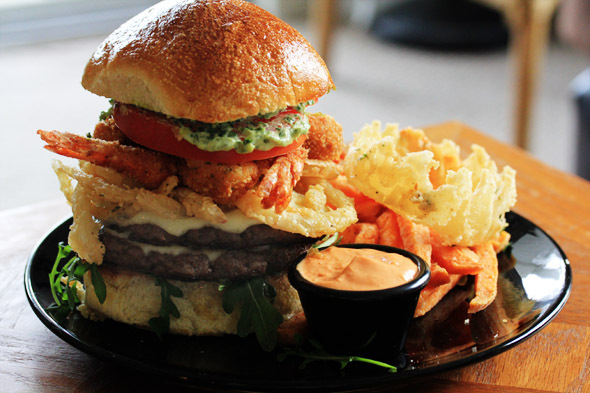 when serving “ready to eat” food like this, you should remove the tails from the shrimp, so the person eating it doesn’t destroy the burger. 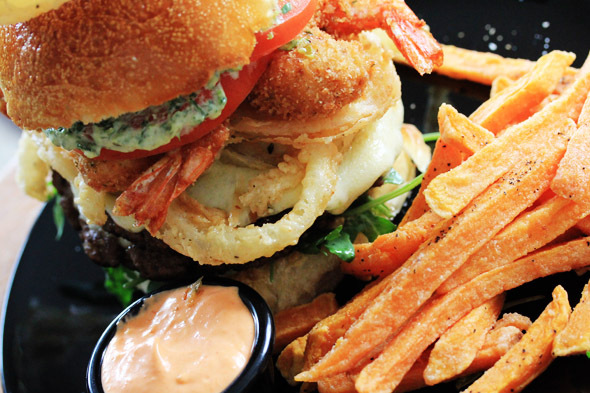 We think this might be the LAST WORD on surf-n-turf burgers using shrimp, and we will be . The KRIT KING burger looks amazing.